Hot Ventures is a responsive business template based on a clean design that looks good on all screen resolutions. Thanks to our powerful framework, we can use variable units for all template elements. That's necessary in development of responsive Joomla template that's optimized for all screens, from the biggest to the smallest. 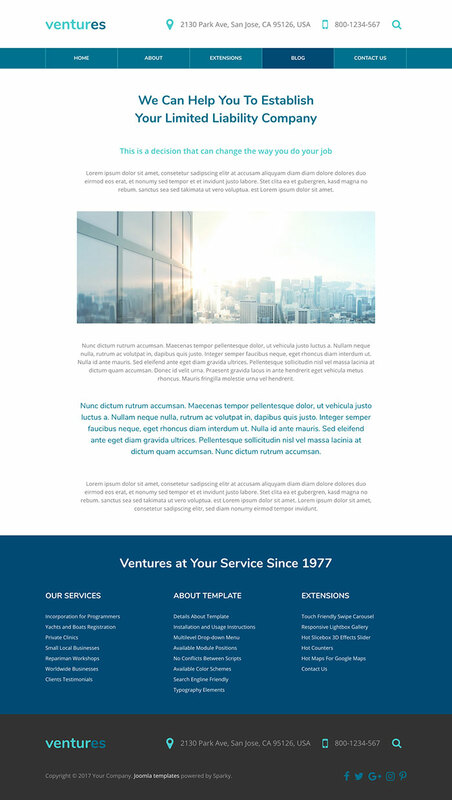 This template can be used as a starting point for development of any kind of business and corporate websites. All necessary elements that visitor expects on a responsive business website are available. The company's contact information are next to the logo. Several slides that we included in the demo of this template are actually intros to the company's main services. The big call to action buttons are used in the slider and other places of the site. Their purpose is to draw the visitor's attention and challenge him to visit one more page of your site. The middle area of the home page is reserved for 6 (or more) boxes that explains how company's services can be helpful for various types of businesses. The bottom area of the template is reserved for counters. They can be used to represent facts about your company as numbers. Also, there's a big footer area with various links to the site's pages. 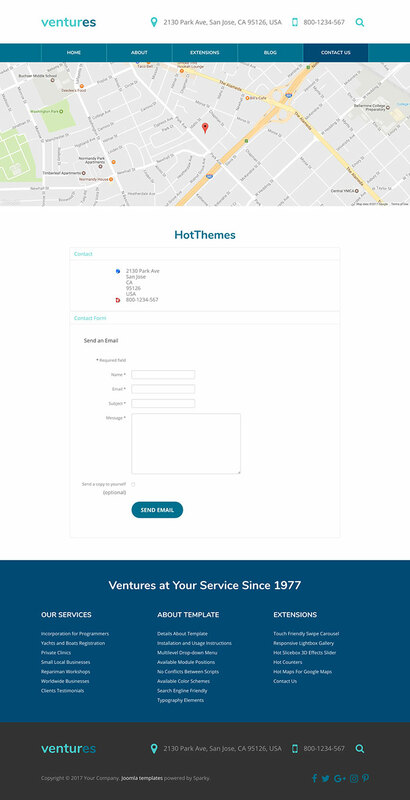 Hot Ventures is responsive business template that comes in 5 color variants. What's interesting here is that each variant contain only one color in 3 tones. There are blue, green, red, brown and purple color schemes. You can also make yours by doing slight changes in the provided CSS files.